By far, the best of the Marvel movies is Captain America: The Winter Soldier. This movie just knocks it out of the park. There’s a lot of character development, which is hard to squeeze in when there’s a ton of action. Too frequently Captain America is seen as just a white-bread goodie-goodie. Here, we get to see some of the sadder, darker aspects of his personality. Robert Redford is fantastic in his role as a S.H.I.E.L.D. big wig, and seeing Cap’ runnin’ around with Black Widow is nothing’ but fun. Plus, the events of The Winter Soldier cause the entire Marvel ‘verse, including TV’s Agents of SHIELD, to pivot. The Russo brothers, the directors, used handheld cameras to shoot the action, which gave it a very gritty, grounded feel. Captain America: The Winter Soldier took in $259 million at the box office. Captain America: The Winter Soldier is full of action, fighting and special effects. The movie is also full of humor, which is sprinkled in between zaps, pops, bangs and the TWANG! of Cap’s shield. The cast is (of course) talented, so their delivery is always spot on. Chris Evans and Anthony Mackie, especially, can bring the funny. 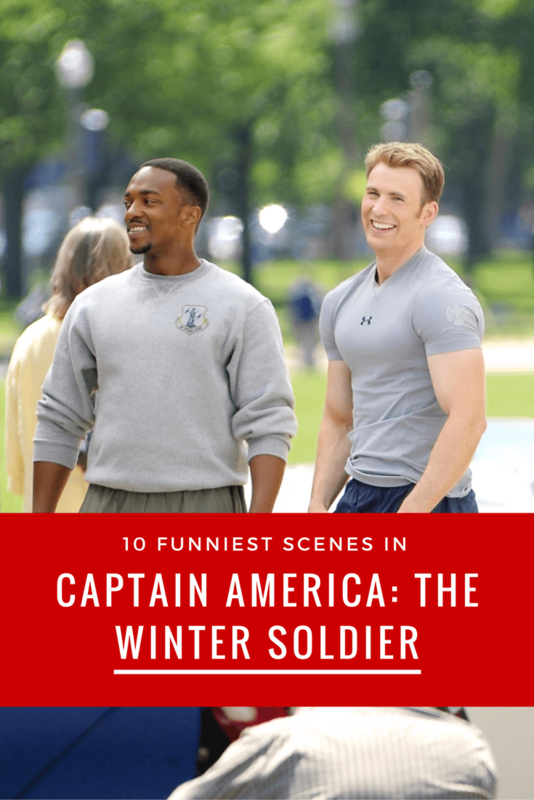 Here are my 10 funniest scenes in Captain America: The Winter Soldier, in no particular order. SPOILERS! LOOK AWAY IF YOU HAVEN’T SEEN THE MOVIE! Reflection of Black Widow chewing gum. When Steve is preparing to leave the hospital after Nick Fury’s attack, he notices the vending machine. He hides the top-secret drive in the slot behind the bubble gum. When he returns to retrieve it, we see that it’s missing. But then we see Natasha popping gum in the reflection of the vending machine. Smarter viewers quickly figure out that she got the drive! “Captain Rogers.” [Beat] “Neighbor.” After Agent 13’s cover is blown, she bumps into Steve outside Alexander Pierce’s office. She greets him, “Captain Rogers.” And as he passes her he says, “Neighbor.” Frosty! “That’s not your style.” “You’re right. It’s hers.” When Steve and Natasha have Jasper Sitwell on the roof the of building, Sitwell snarks that it isn’t Captain America’s style to drop someone off of a building. Cap’ says, “You’re right. It’s hers.” Then he steps aside and Black Widow kicks Sitwell off the building. Boom! “Before we get started, would anyone like to get out?” Steve has just had a conversation with Alexander Pierce when he gets on the elevator at S.H.I.E.L.D. As the elevator fills up with strong, fit men, he realizes they are there to take him down. After the last men get on he says, “Before we get started, would anyone like to get out?” Gotta get up a lot earlier than that to get the drop on Cap’!